To change fixture mid season, follow the steps given below. 4. Make the necessary changes that you wish to edit the records. 5. Navigate to the Teams tab. 6. Click the New Team option. The New Team page will be displayed. 7. 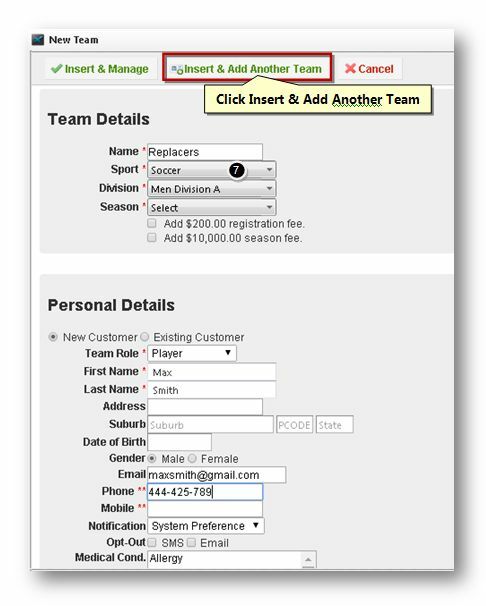 Enter the team details and personal details for adding a new team and click the Insert & Add Another Team button. 8. 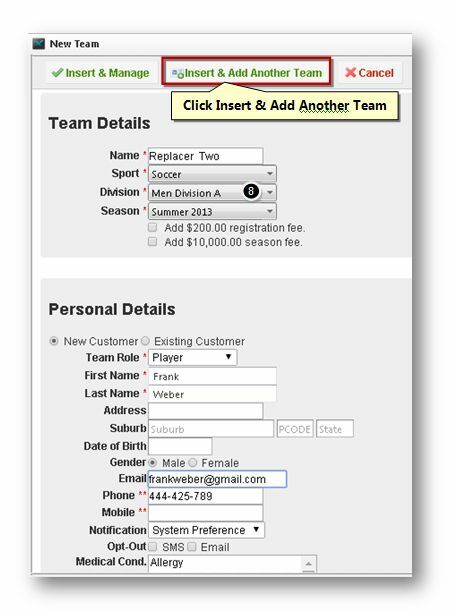 Enter the team details and personal details for adding a new team and click the Insert & Add Another Team button. For more information refer to the following section. 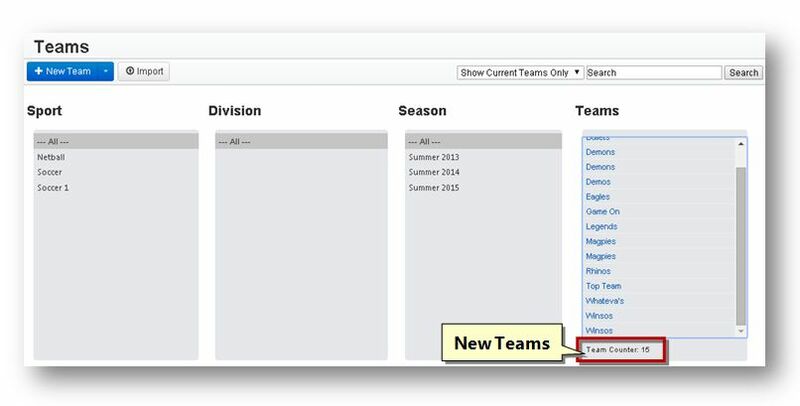 The new teams will be added and displayed on the teams section. 9. 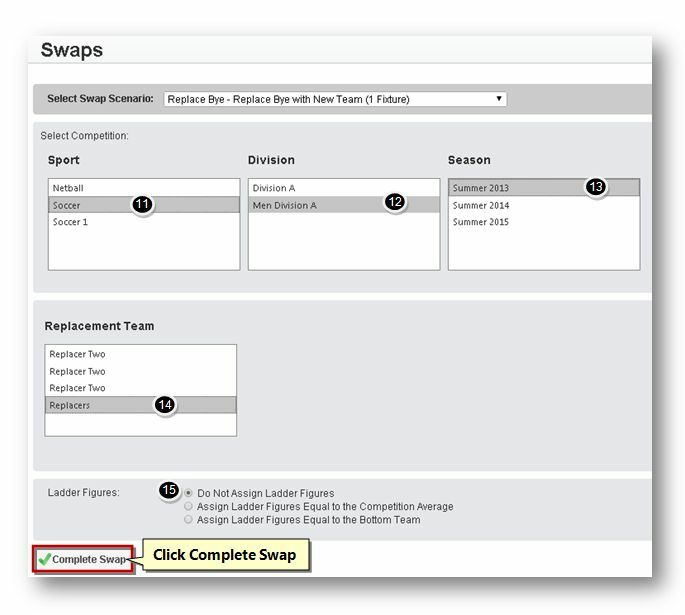 Select the Swaps option from the Competitions drop down list. The Swaps page will be displayed. 10. Select the swap scenario from the Select Swap Scenario drop down list. The select competition section will be displayed. 11. Select the name of the sport to be swap in the Sport field. 12. Select the name of the division to be swap in the Division field. 13. Select the name of the season to be swap in the Season field. 14. Select the replacement team name from the Replacement Team field. 15. Select the ladder figures from the available options in the Ladder Figures field. 16. Click the Complete Swap button. The swap will be completed. 17. 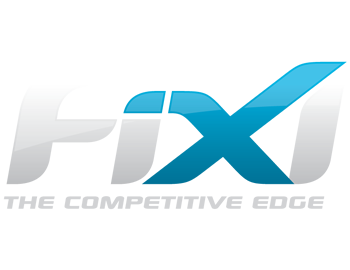 Select the Manage competitions from the Competitions drop down list. 18. Select the competitions that you wish to edit by checking the box in the row of the competitions. 19. Select the Edit Fixture from the Edit drop down list. 20. Click the Delete Fixture by Round button. 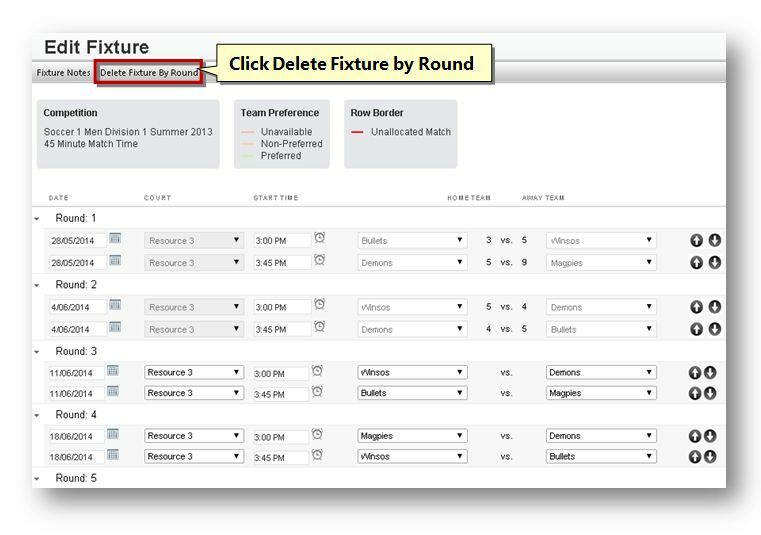 The Delete Fixture by Round page will be displayed. 21. Enter the round number to delete from the selected competition. 22. Click the Delete button. 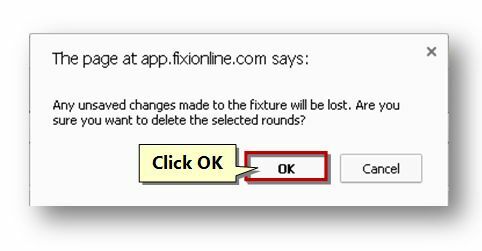 The message box informing you about the deletion of the selected round will be displayed. 23. Click the OK button. The selected rounds will be deleted. 24. Select the New Fixture from the New drop down list. The New Fixture page will be displayed. 25. If you wish to edit the selected competition click the Edit Team Order button. The Modify Team Position in Fixture page will be displayed. 26. 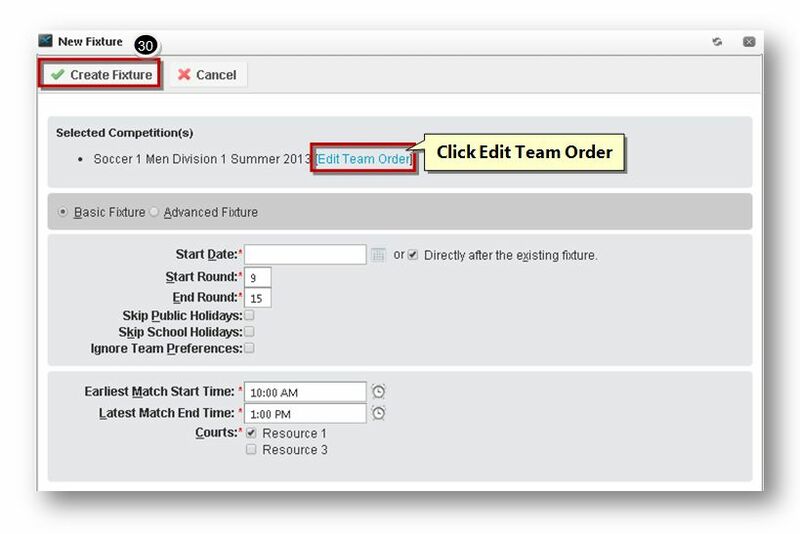 Modify the team position in the fixture in the Modify Team Position in Fixture field. 27. Modify the rounds in the Round Preview field. 28. If you wish to preview the team positions to generate click the Generate Preview button. 29. 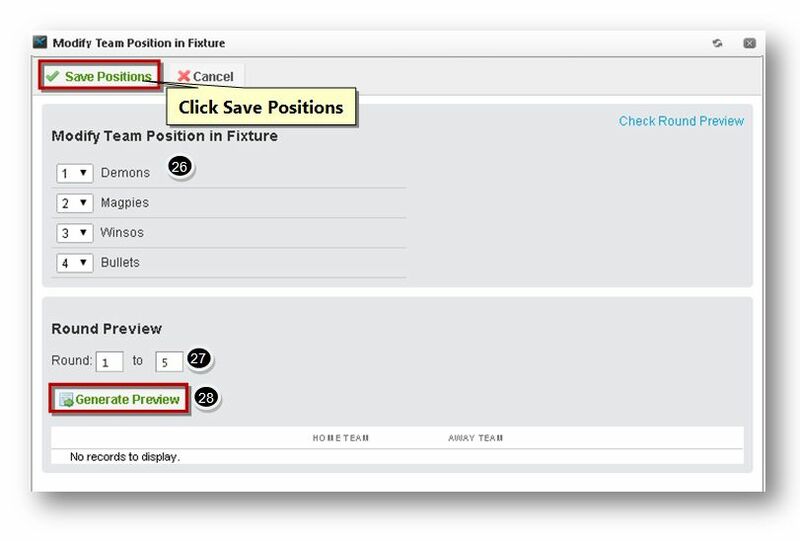 Click the Save Positions button. 30. If you wish to create new fixture click the Create Fixture button. 31. Select the Edit Ladder option from the Edit drop down list. 32. Select the round that you wish to edit ladder from the Select Round drop down list. 33. Edit the points of the different teams. 34. Click the Update Ladder button. Inserting Matches into an Existing Fixture.